The geek corner of the internet exploded last night when Nathan Fillion tweeted a link to a site, Much Ado The Movie. 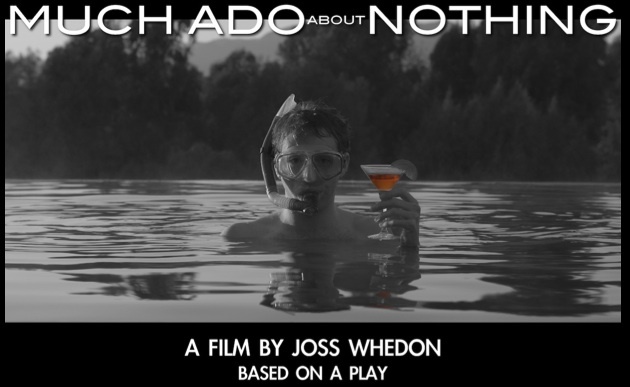 The site contains just a single image announcing that principle photography has been completed on Joss Whedon's Much Ado About Nothing, presumably based on Shakespeare's play of the same name, and a list of the star-studded cast chock full of Whedon favorites. Why did the internet have a conniption fit? Because the media had never heard of the project before last night, an all but impossible feat for a film with such a high profile cast and crew. So, what can we glean from the measly amount of info provided and what insight can Angel scriptwriter Mere Smith provide? First, the story. The lone photo of a young man wearing snorkeling gear and holding a cocktail (a sazerac?) indicates that Whedon's film won't be a strict adaptation of The Bard's play. Shakespeare's work is the story of two couples, the primary two are snarky adversaries that bicker but secretly have feelings for one another, and the secondary pair, a twosome much more open about their feelings. Of course, since this is Shakespeare we're talking about, there's a meddlesome villain/catalyst that tricks the first into revealing their feelings and the second into doubting each other. Next, the cast. Amy Acker and Alexis Denisof (Fred and Wesley from Whedon's Angel) receive top billing, presumably playing the primary couple, snarky Beatrice and Benedick. Other actors include Nathan Fillion (Castle), Fran Kranz (Dollhouse), Riki Lindhome of Garfunkel and Oates fame, Reed Diamond (Franklin and Bash), Tom Lenk (Buffy the Vampire Slayer), Sean Maher (Firefly), and Clark Gregg (The Avengers). Fillion is rumored to play the bumbling sheriff Dogberry who uncovers the villain's plot. The release format. We know that Joss Whedon has viewed the internet as a great platform for hosting projects. His Doctor Horrible's Sing-a-long Blog musical paved the way for mainstream content to be released directly to the internet. While nothing on Much Ado's site indicates the film will be released on the internet, I'd guess the chances are 50-50. Finally, the project's history. Scriptwriter Mere Smith (Angel) tweeted this morning that Whedon often hosted Shakespeare readings at his house on the weekends with cast and crew from Angel. "Alexis," she writes, "was jaw-droppingly good." These informal weekends were almost ten years ago. Could it be possible the project has been ten years in the making? So, what do you think? What rumors have you heard?